This spacious living room includes a sleeper sofa couch, a comfy chair, TV with DVD player, Electric fireplace and a dining room table that seats four. This unit also includes a cozy patio off of the living room where you can relax with a nice cup of coffee in the morning or enjoy northern Michigan amazing sunsets. It includes a couple of chairs and a table. This lovely kitchenette area has everything you may need on vacation. It includes a stove-top, microwave, small fridge, coffee maker, sink, toaster & dishwasher. Plus a bonus extra counter-top with two bar stools. All plates, cups, silverware and some pans included. This 1-bedroom condo has a king-size bed with a queen-size sleeper. Beautiful dark wood wainescoating greets you down the hallway. There is a glass cooktop in the kitchenette near the table with seating for two. There is a dishwasher, convection microwave oven, and a smaller sized refrigerator. This condo hotel is a perfect location when staying in Charlevoix – we’ve stayed here several times now and will return. It is right on the edge of downtown, so you can easily walk to shopping and dining. There is a great selection of restaurants, including Scovies, East Park Tavern, The Weathervane and Lake Charlevoix Brewing Co. Our room was very clean and well equipped, and the staff is very friendly and accommodating. The unit was very clean. It appears to have been recently remodeled. New carpet and kitchen. We love This was our 5th or 6th stay at Pointes North Inn. We have had different units. 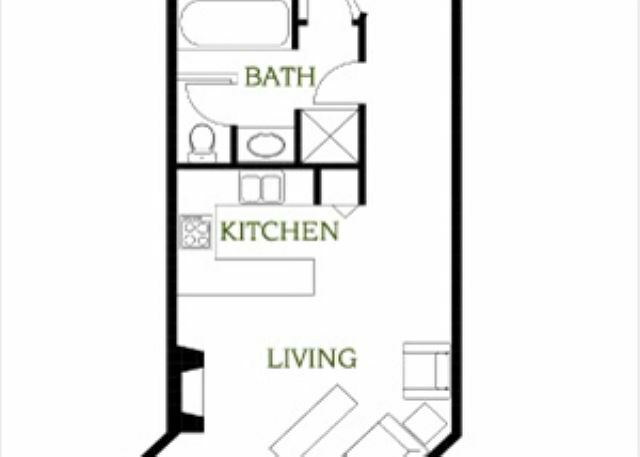 We like this unit because it has extra living area in the living room. The only negative with this unit is that it has a tiny refrigerator. It is about the same size as the one we bought for our kids when they went to college. It was O.K. for this stay because it is winter and we left pop/milk/wine on the porch. But it would not be good for use in the summer.